Niall Alexander of Dumfries Cricket Club has been impressing the coaching staff at County side Worcestershire over the past few months. He was spotted by a scout whilst opening the bowling for Scotland U15s in England last season and had a successful trial in matches at Worcestershire at the end of last season. During the winter the youngster has been working hard on the technical side of his game training with Scotland U17s under the supervision of Cricket Scotland Coach, Craig Wright. Over the Easter holidays the sixteen year old was invited to play for the Worcestershire Academy side at a 3 day cricket festival hosted by Shrewsbury School. The county’s Academy side is used to identify, and develop the next generation of Worcestershire players. 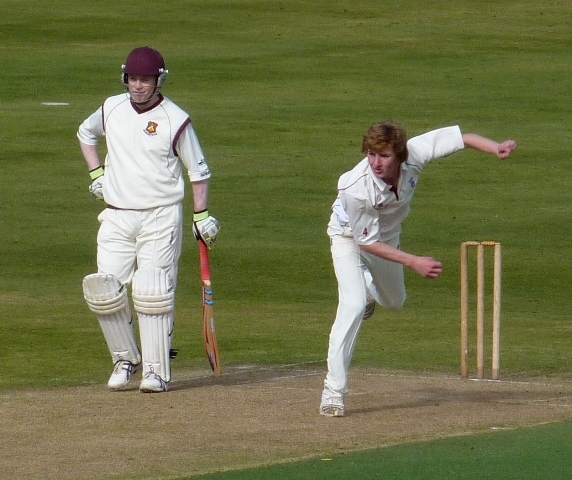 Against Millfield School his six over spell brought 1 wicket for 11. Rain reduced the second match to a Twenty20 match which was won by the hosts, Shrewsbury School. Promoted to open the bowling against the previous winners Worksop College in the third game he took 2 wickets for 17 off 7 overs of pacy swing bowling. As a result of his performances Academy Head Coach, Damian D’Oliveira has invited him to return to Worcestershire for further games over the coming summer. So the Nunholm player has more future outings for their Academy side in prospect.